On an ancient island in Bengal, between the waters of the Ganges and the Sarasvatl, a young Peace Corps worker began a mystical, inner journey into a new and deeper reality…. 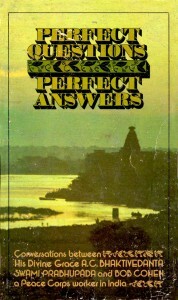 To download Perfect Questions, Perfect Answers please click on the book cover image on the left. I began to ask my questions. Inadvertently, I had approached a guru, or spiritual master, in the prescribed way-by submissively asking questions about spiritual life. Srila Prabhupada seemed pleased with me, and over the next several days, he answered my questions. I asked them mostly from an academic point of view, but he always gave me personal answers so that I would actually spiritualize my life. His answers were logical, scientific, satisfying and amazingly lucid. Worth to read for everyone. It is not available in Hindi. Only English. Please read the English. Let me pay my humble obeisances to Madhudvisa but add my comment. It is 100 percent true that in order to attain the mercy of Lord Sri Krishna it is of great importance to take the initiation from an authentic spiritual master in the Parampara originating from Lord Sri Krishna. Our spiritual life actually begins at that point and surrender is needed. I must say though that the comment by Namita does not dispute that or say anything against that. Namita was just making the point that life too is also a teacher. Granted not always a positive or correct one, but it is a teacher as well. We need to know the difference between proper guidance and bad influence however. In our temples we have heard the analogy many times about the child who when told “don’t touch the fire or flame on a stove” sometimes does not take intelligent advice and chooses to learn the hard way. Some people are like that. They learn by being burned before they understand and sometimes not even that helps. Life is also a Guru of sorts or Krishna would not place such importance on having us repeat so many births with the goal of eventually learning and getting it right by surrendering to Him in love and devotion at some point. He observes from the heart as Paramatma and awards the result to teach us. In this connection we can also see how even life as a teacher is also guided by Lord Sri Krishna. He is behind everything and not even a blade of grass moves without His control. But it is truly the guru who represents Lord Sri Krishna who is the most merciful and teaches the most important and enduring message. There are many teachers in life, but the Guru who represents Sri Krishna is best and is completely needed for our spiritual advancement in connecting with God “Lord Sri Krishna” and attaining our original constitutional position in pure love and devotion. Yes. Life is a teacher. But life has no potency to teach us about Krishna. And without knowledge of Krishna life is useless. So life is a useless teacher. The impersonalists to a great extent rely on life to teach them. And you are right of course that one can learn many things from life. But everything we learn from life is negative. You can learn from life that you can not be happy in any way in the material world. You can learn from life that the ultimate result of any attempt we make to become happy through sense gratification will be frustration. You can learn from life that every relationship will ultimately end and if the relationship has not already caused you a great deal of suffering the end of that relationship will cause you to suffer greatly. So from life we can learn that all relationships will ultimately cause us suffering. So from these ‘teachings of life’ we can get the impersonal / voidist philosophy of trying to give up all relationships, trying to stop all activities, and ultimately trying to cease to exist, because or lessons from life will teach us that ultimately even existing is a source of distress and suffering and anxiety for us. Actually even it may be possible for an impersonalist to become liberated through the teachings of ‘life’, he may be able to reach the point of brahman liberation. But in that impersonal, senseless and activityless state the eternally active spirit soul is not happy. So even though through the teachings of ‘life’ he may become liberated, he will not be able to remain in that impersonal liberated condition, because there are no activities there, there is no association there, he is completely bored there… So he has to come back down again to the material world and these fallen impersonalists are generally somewhat in the mode of goodness and when they come back down to the material world again they feel impelled to do some charity work, open some schools and hospitals, feed the poor, etc… So these are the impersonalists who say ‘brahma satyam jagat mithya’ — brahman is truth but this material world is false. But even if they are able to reach the ‘true’ impersonal brahman effulgence, they get bored there and can not stay there, and then they have to come back to the world they previously declared to be false and open schools and hospitals. Why? What is the point of opening schools and hospitals and feeding the poor in a false world? It makes no sense. But they have no alternative. Because impersonal liberation is boring and they can not stay there. So life is a useless teacher because it can at most only teach us up to the point of impersonal liberation, and that is useless, because everyone will fall down from this impersonal so-called liberation. This book is so wonderful. I have just ordered a hard copy for myself. Is there an audio file of the same? It would be absolutely wonderful to hear Srila Prabhupada himself talking through this. Life by itself is Guru to every human being. We can learn the cause and effect of events in life as observed from aerial view. Its important to understand God as regulator of such events like the referee. The ONLY way one can become Krishna conscious is if one is so fortunate to be able to get the association of and surrender to and serve a bona fide spiritual master. If you accept ‘life’ as your guru you may be able to get to the point of impersonal realization, but ‘life’ can never help you reestablish your relationship with Krishna, that requires surrender to and service of the bona fide spiritual master. Namitha its your understanding.Everyone of us have different speculations about God.But our limited brains can’t understand the supreme truth just by speculation.So we should better consult the Holy scriptures.